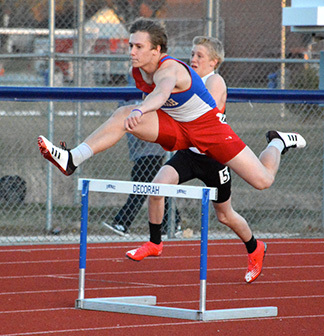 In all, eight boys’ track teams braved the winds that accompanied the spring-like weather with Decorah finishing first, scoring 175 points. Charles City came in second with 110 points. South Winn garnered 59 points, good for sixth. Between the two local squads, they garnered 11 first-place finishes. The Vikes had 10 events claim the gold medal. Keaton Solberg, Andrew Magner and Gus Hayes remained undefeated in their respective events. Solberg cleared 6 feet even to win the high jump, while Magner cruised over the 100-meter hurdles to the finish line in 15.44 seconds. Hayes collected the 1600-meter title in 4:45.62. In the 400-meter dash, Cameron DeLong sprinted to the finish line in 54.05 to win gold. Breaking the tape in the 200-meter dash in 23.62 seconds was Beirgen Gunhus-Dansdill. Austin Wilkins, James Groux, Drew Snyder and Magner got things started in the relays, winning the shuttle hurdle relay in 1:06.04. Mikel Fullhart, Tucker Young, Breydon Johnson and Solberg had the top time in the 4x100. The quartet broke the tape in 47.21. The 4x100 weight man squad of Elijah Mitchell, Charles Robinson, Sam Wilson and Logan Halverson had the winning time of 50.77 seconds. Speedsters Fullhart, Solomon Thompson, Solberg and Haywood Stowe won the 4x200 in 1:40.22. Winning the distance medley relay in 4:26.90 was the quartet of Nick Einck, B. Johnson, Briggs Duwe and Hayes. South Winn took first and second place in the 3200-meter run. Senior Paul Hageman was the lone champion crowned, breaking the tape in 10:58.54. Emmett Schwartzhoff circled the oval in 11:32.99 to claim runner-up. The Warriors took several other second place finishes, including Noah Tieskoetter’s silver in the long jump and 100-meter dash. The junior flew 20 feet, 6.75 inches in the long jump and sped down the track in 11.66 seconds in the sprint race. The 4x100 of Zach Taylor, Cael Kuboushek, Tieskoetter and Jacob Herold posted a time of 47.73 seconds, good for second.